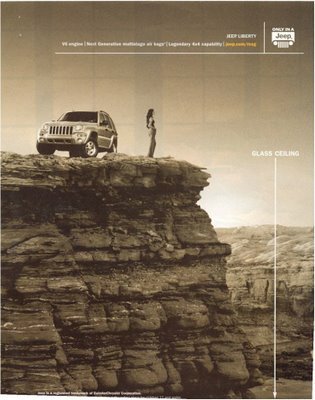 The Jeep Liberty–notice on the right it says “Glass Ceiling” and has an arrow pointing down below; so structural inequality at work is trivialized, and again, “liberty” is something we can purchase. These ads go nicely along with the old Virginia Slims campaign, these other “liberated women” themed ads Lisa posted previously, and the “right hand ring” ad I posted. Gwen Sharp is an associate professor of sociology at Nevada State College. You can follow her on Twitter at @gwensharpnv.